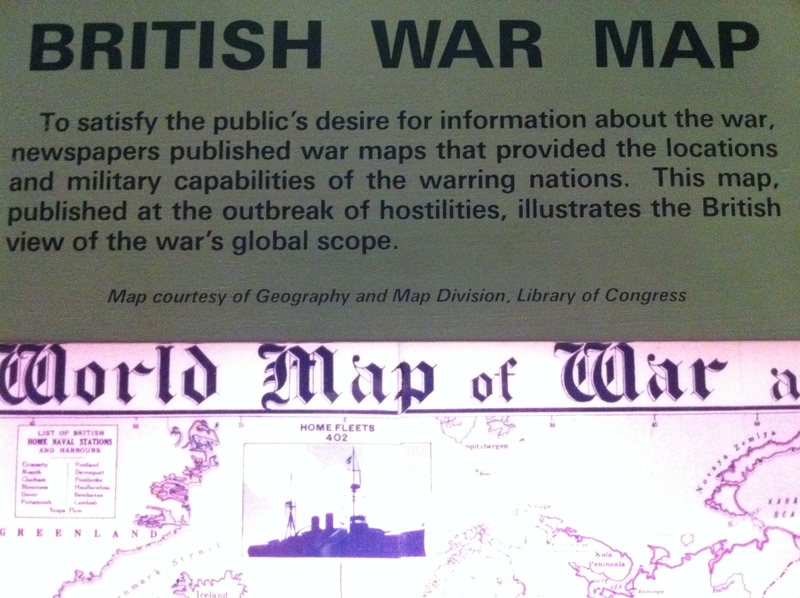 “To satisfy the public’s desire for information about the war, newspapers published war maps that provided the locations and military capabilities of the warring nations. 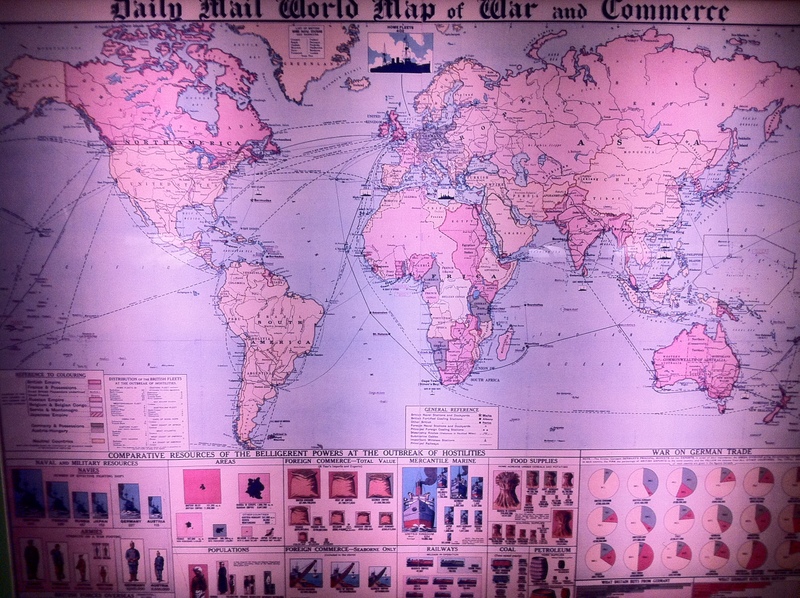 This map, published at the outbreak of hostilities illustrates the British view of the war’s global scope.” I’m intrigued by this find and wonder how often these maps were updated and what sources were used. Would public opinion at the time have differed had live crowdsourced crisis maps existed? Towards the end of the WWI exhibit, I came across this sign, originally posted near the entrances of the London Underground. 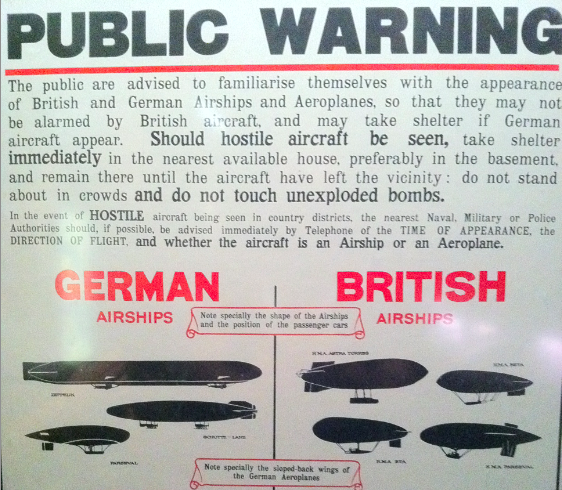 The warning relates to hostile German aircraft that had begun to bomb London in early 1915. On September 8, a Zepellin raid on the city cause more than half a million pounds of damage. What stuck me about this warning were the following instructions: “In the event of a hostile aircraft being seen in country districts, the nearest Naval, Military or Police Authorities should, if possible, be advised immediately by Telephone of the time of appearance, the direction of flight, and whether the aircraft is an Airship or an Aeroplane.” Crowdsourcing early warnings of WWI attacks. Know of other interesting examples of crowsourcing during the first (or second) world war? If so, please feel free to share in the comments section below, I’d love to compile more examples. This entry was posted in Crisis Mapping, Crowdsourcing, Early Warning and tagged Bombing, London, Map, one, war, World, WWI, zepellin. Bookmark the permalink. Obviously Crowdsourcing is not only used to deliver aid and regain transparency. It may as well be used to gather intelligence, either indirectly by services using public sources or even with people reporting directly. Are there any ongoing discussions about moral limitations or misuse of crowdsourcing? Thanks for the interesting blogpost! Unf, I cannot add any examples of crowdsourcing from WWI but I thought I would contribute with the following: A few days ago I was thinking about how mapping had been used throughout history (I will blog about it here in the next few days: http://www.betterplace-lab.org/en/blog ). In particular, I looked at how crime mapping has developed in the US. It actually roots in the 70s and took a few decades to spread to the social sector, I wonder why. Anyway, I was wondering how you could combine crime mapping with crowdsourcing, and then it hit me: Crime reporting has always been based on crowdsourcing. If somebody stills your wallet, then you are the one who goes to report it. The state cannot be everywhere, police patrols can’t and should not cover every area and every aspect of life. So the police uses citizens’ contributions. So I think there might be areas where crowdsourcing has been used intuitively prior to Howe inventing the term in 2006: Warfare and crime reporting may be such examples. @Bjoern Kunter. I cannot agree more. I believe crowdsourcing may have a dark side to it too. I have to think about a talk at UN Open a few months ago. There was a research fellow from Oxford who, having received access to military data from Iraq in 2003, realized that there were crowdsourcing like approaches used by the military to spot insurgents in Iraq. You may check it out here: http://www.unglobalpulse.org/blog/video-thursdays-open-un-panels . The discussion is by the way pretty interesting. thanks a lot for sharing these! Really impressive work.